While this was happening, we started playing with drugs. And diagnoses. Medical science figured out why people were thrown into institutions without understanding that some of those people can function in general society. And, yet, we have not addressed many things that make things easier and fulfilling for those of us who suffer from emotional/behavioral/mental illness. This is where “self-care” comes into play. We’re stressed beyond belief. Our jobs, our home life, our social interactions – in real life and electronically – our challenging our souls. Sometimes we feel that we’ve reached out a point of tolerance that nothing will ever turn us around towards the positive. Some have said that efforts towards “self-care” are forms of escaping reality. It could be. And, yet, it has become the newest wave of travel. Travel is an escape from reality. While it puts you into another reality, it puts distance between you and the stresses you left behind. It could mean a staycation at a fine hotel with amenities, such as a spa, Jacuzzi, and fine food. It could also mean taking a drive or flight to another community for a change of scenery. Because you have been doing some self-therapy through “self-care” travel, I decided that it was something I had to do. Just like you, I have been stressed out on many fronts. It has been a constant battle to maintain relevance in a field where all comers are stepping up their game. It is about fulfilling a day job that can sometimes by stressful on various levels. Then, it gets filtered to home and social arenas. You are not supposed to escape, but you might have to do so to save your sanity. My plan was half-cocked, at best. The destination was thought of, but not decided until the last minute. In case, I packed a bag for an overnight stay – without having a reservation at a hotel. My whole goal was to get the hell out of dodge. But, I wanted to do so with connecting folks along the way. For example, there is a car collector friend in Eau Claire whom I can have blunt and honest conversations with. He owns a restaurant in town, which means a lunch stop. 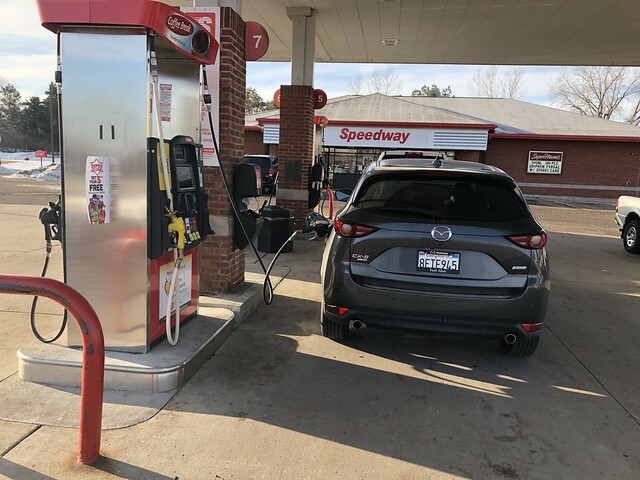 I pointed the 2019 Mazda CX-5 Signature AWD eastbound on Interstate 94 and decided to spend the morning in Western Wisconsin. The sun was out with temperatures climbing out of the 20’s (Fahrenheit – it’s still winter here in Minnesota and Wisconsin). It made for a beautiful drive. I could not ask for anything better. This winter was brutal for us. In February, the Twin Cities saw a snow fall of about 39 inches. MSP recorded a snowpack of 19 inches. With temperatures rising, the melt had begun. Rivers in Nebraska and Iowa began to swell with flooding destroying communities. Our melt is slower, which only yielded minor flooding, but who knows what this coming week will bring? If that doesn’t induce stress – all other line items in your life are equally as frustrating. One of the byproducts of a bad winter is road conditions. The potholes are getting bad in the Twin Cities. It was worse in Eau Claire. Not to mention the amount of ice and snow that are still on the roadways. It made for some interesting driving. From lunch, I ended up mentally “flipping a coin.” Should I head to La Crosse or Rochester? Seeing the route to the home of the Mayo Clinic, I chose the latter. And, I chose wisely. Going a southwesterly direction meant going towards the sun at certain angles. It was a lovely sunny day with the temperatures now above freezing. The snowpack had been melting, revealing frozen ponds on farm plots in many spots. A bit of minor flooding, but not enough to close sections of roads. 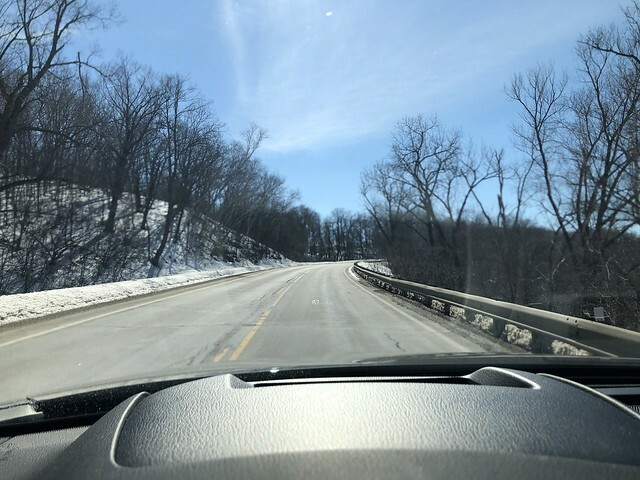 The Wisconsin and Minnesota sides yielded some winding sections of state highways through their respective bluffs. 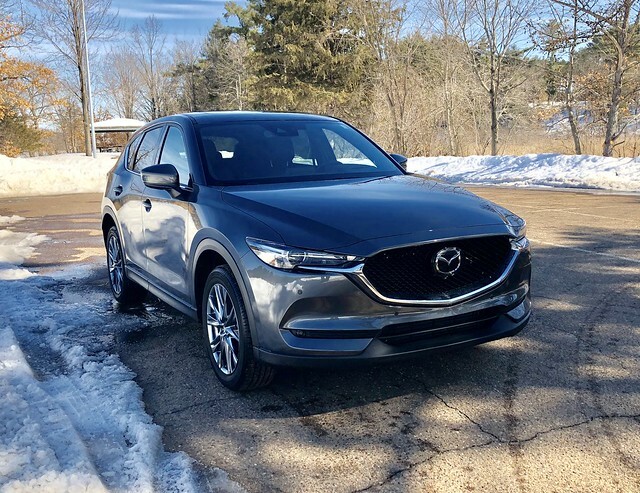 If the roads were absolutely perfect and the air temperature warmer, this would call for a sportier coupe, sedan, or hatchback to truly enjoy each mile. Alas, I had an SUV. Sadly, I wished it had less roll and lean in the suspension geometry. And, better tires. Sorry, Mazda, these Toyos were not inspiring at all. Arrival into Rochester from its northeast side was surprising. The city never quite grew beyond a certain boundary. The east side seemed to have more countryside than suburban sprawl. 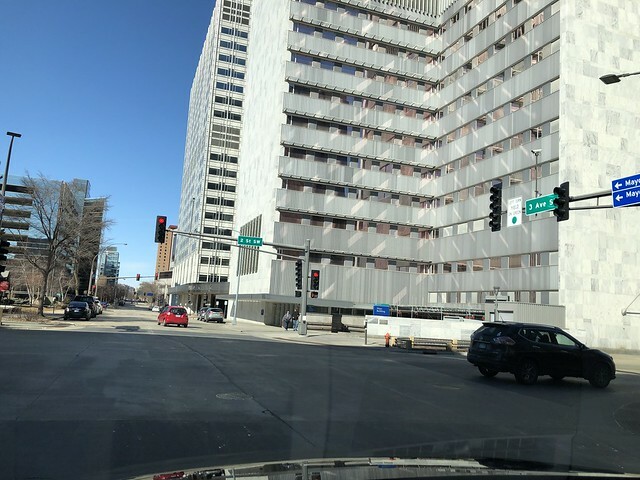 For a city that is home to the Mayo Clinic, you would think that it would swell beyond it central core, and its southern and western shopping outposts. The GPS took me south of the main Mayo building. It is a logical way, since it skirts city hall. Although, one’s memory of the city – a place I visited over the past 17-18 years – can be spotty to find the quickest way to get to certain points of it. One example, forgetting which was the short way to catch U.S. Highway 14 westbound without having to slog to U.S. Highway 52 to do so. Somehow after booking my overnight spot, my body began to send a message. “Self-care? You should have taken better care of yourself in the first place!” A cruel message that turned into a level of exhaustion that should have happened many hours before. It was on cue when I presented my ID and card to the hotel front desk than my head received a torpedo of soreness that went along with the exhaustion. Honestly, all you want to do is relax. You want to recalibrate your life. You want to reclaim what was lost in the hustle and bustle of work, home life, and overall humanity. You want to expunge your frustrations with the universe. This is your opportunity to rest. You earned the drive and checked into a place with a reasonably comfortable bed and a few amenities that you need within walking distance of your room. It brings up a few things about “self-care” travel. First off, you need to be in a position where you are able to do so. Plus, you have to have some things in place before you do take off somewhere to take care of yourself. Since we are individuals, those personal items are your own. If it means ensuring your family is fine while you’re gone or that certain services are in place, so be it. Secondly, match your destination to what makes you happy. If it’s the finest hotel in the downtown core of the city you live in, or just a small flight away from home – the goal is to smile every time you take every step away from the toxicity in your life. If you know where to find things that make you happy, walk in, breathe, and enjoy a new place to discover those things. Lastly, turn off social media. Don’t even turn on the television or listen to the radio. Pop on a playlist from your music app. You don’t need to check in to wherever you’re at only to get some people commenting some idiotic acronym, such as “TFTI.” Translated: “thanks for the invitation.” Consider this: it’s not your fault that you did not invite said person to your “safe-care” travel plans. After I got some rest, I checked out of my hotel and took to the road. Did I get the “self-care” I needed? On some level…maybe. Next time I should consider a better plan. Spend a bit more money. Go a bit more incognito. Drop into a place where I do not know a soul – and those places are dwindling.